Otto Porter Jr. scored 26 points and Bradley Beal pitched in with 22 points as the Washington Wizards defeated the Charlotte Hornets for the first time this season, winning 107-93 on Saturday afternoon at Capital One Arena in Washington D.C.
With the win, the Wizards (42-34) officially clinched a playoff spot. The Miami Heat and Milwaukee Bucks sit a game and 1 1/2 games back, respectively, in the seventh and eighth spots in the Eastern Conference, but ninth-place Detroit (36-40) is well out of striking distance. Porter, who also pulled in a team-best 11 rebounds, and Beal each made six 3-point shots, combining to go 12-for-18 from long range. John Wall, who played in his first game since Jan. 25 after a knee injury, scored 15 points and 14 assists and Mike Scott also added 15 points for the Wizards, who won for only the second time in their last six outings. Visiting Brooklyn used a strong second half to get the game to overtime and beat Miami to prevent the hosts from clinching a playoff berth. The loss snapped the Heat's nine-game home winning streak. Miami slipped to the eighth seed in the Eastern Conference, a half-game behind Milwaukee. Kevin Durant recorded 27 points, 10 rebounds and five assists, and Golden State ended a three-game slide with a victory over host Sacramento. Klay Thompson returned from a thumb injury to score 25 points as the Warriors won for just the fourth time in their past 11 games. 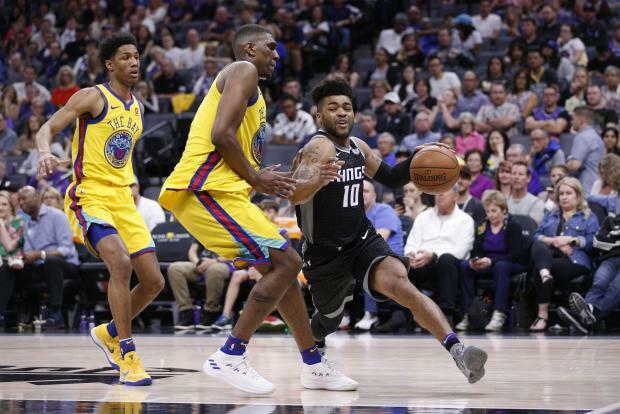 Quinn Cook added 10 points for Golden State, which received eight points, nine rebounds and seven assists from Draymond Green. Golden State reserve guard Patrick McCaw was taken off the court via stretcher after being undercut while scoring a basket with 41.8 seconds left in the third quarter. The Warriors said McCaw was transported to nearby UC Davis Medical Center. Marcus Morris had 25 points and nine rebounds and Jayson Tatum scored 24 as host Boston beat Toronto in a battle of Eastern Conference powerhouses. Terry Rozier added 21 points and seven assists and Al Horford had 14 points for the Celtics, who earned their sixth straight victory and pulled within two games of the Raptors for first place in the East with six games remaining for each team. DeMar DeRozan scored a game-high 32 points with seven assists and seven rebounds, Serge Ibaka had 15 points and 10 rebounds and Jonas Valanciunas had 13 and 11 for Toronto, which suffered its fourth loss in the last seven games following an 11-game win streak. Andre Drummond had 22 points and 17 rebounds to lead five starters in double-figure scoring as visiting Detroit picked up a crucial win over New York. Michael Beasley had 32 points and streaking point guard Trey Burke added 18 points and 15 assists to lead the Knicks, who lost their third straight game and for the fifth time in six games. Without Blake Griffin, who is sidelined with a bone contusion, the Pistons won their fourth straight game. Detroit remains in ninth place in the Eastern Conference playoff race, 4 1/2 games behind Miami.